Sevilla have sacked manager Pablo Machin, a day after they were dramatically knocked out of the Europa League by Slavia Prague. The five-time Europa League winners suffered a 4-3 defeat in the Czech Republic, thanks to Ibrahim Traore's extra-time goal in the 119th minute, which saw them lose 6-5 on aggregate. Machin, 43, joined from Girona in May. 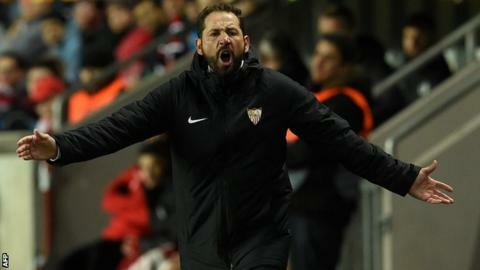 Sevilla blamed "a string of poor results in past weeks" for his dismissal after 10 months. The club are sixth in La Liga, five points off the Champions League places. Since Unai Emery left the club in June 2016 - for Paris St-Germain before his move to Arsenal in 2018 - Sevilla have had four managers. Director of football Joaquin Caparros will take charge of the team, having managed the side for a month last season when Vincenzo Montella was sacked.